« Should a gentleman offer a Tiparillo to a violinist? The classic nursery combination should go down well with the children. Cream the butter and sugar, sieve the baking powder and flour together and stir into the butter mix with the salt then slowly pour in the cream until well mixed. Chill for about 30 minutes before rolling. On a floured table, roll the pastry out to about cm thick and line four approx 8-10 x 4cm deep, lightly greased, individual tart or pie tins or 1 larger one, allowing the pastry to slightly overlap the edges. Roll 4 tops to fit the pies, then leave to rest for another 30 minutes. Split the vanilla pod in half lengthways and scrape out the seeds with a point of a knife. Put the cream, vanilla pod and seeds into a small saucepan and bring to the boil. Remove from the heat and leave to infuse for about 10 minutes. In a bowl mix the egg yolks, sugar and cornflour together. Remove the vanilla pod from the cream and pour on to the egg mixture and mix well with a whisk. Return to the pan and cook gently over a low heat for a few minutes, stirring constantly with a wooden spoon until the custard thickens, but without letting it boil. Remove from the heat and give a final mix with a whisk and transfer to a clean bowl. Remove the lined tart tins from the fridge for about 15 minutes then mix the bananas with the custard and spoon into the tarts (you may have some mix left over so you could make extra with pastry trimmings, or I’m sure the kids will polish it off). Brush the edges of the pastry with the beaten egg and lay the tops on, pressing the pastry together with your thumb and forefinger to seal it then trim any excess with a knife and neaten up the edges again with your thumb and forefinger. 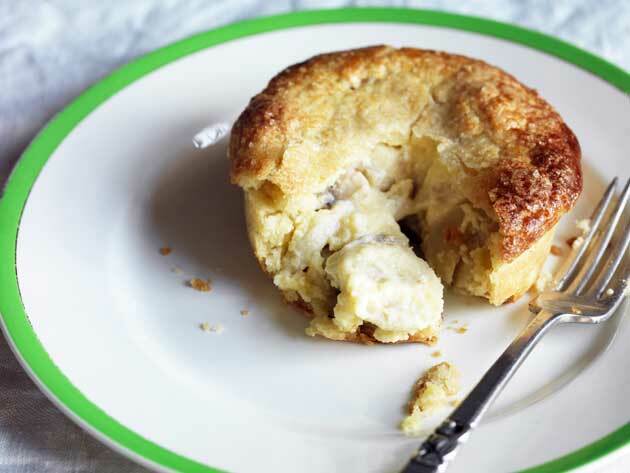 Brush the pie tops with the beaten egg and scatter with the granulated sugar. Place on a tray and bake for about 15-25 minutes or until the pastry is golden and crisp. Leave to cool a little then serve hot or warm. This entry was posted on November 23, 2010 at 8:42 pm and is filed under Food with tags baking powder, banana, butter, caster sugar, cornflour, custard, double cream, egg, egg yolks, flour, granulated sugar, pastry, pie, recipe, salt, single cream, vanilla pod. You can follow any responses to this entry through the RSS 2.0 feed. You can leave a response, or trackback from your own site.